Mr Takashi Kobayashi from Kobayashi, Japan HMD representative collecting the Award on behalf of HMD. New Delhi: Hindustan Syringes and Medical Devices (HMD), one of the largest manufacturers of disposable syringes and the largest for auto disable syringes has been awarded the prestigious ‘2018 Good Design Award’ for its Safety IV Cannula – Cathy Sipclip. 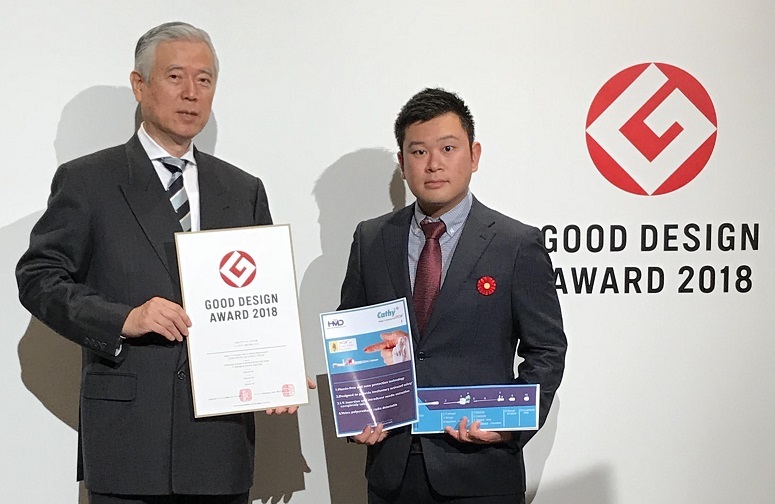 The product earned recognition in the category of Medical Care Products at the Good Design Award 2018 hosted by the Japan Institute of Design Promotion in Japan. “Japanese Good Design Award 2018 is an additional feather in the cap to the MDSAP (Medical Device Single Audit Plan) quality assurance certification from UL (Underwriters Laboratories, USA) and ICMED (Indian Certification for Medical Devices) certification HMD received from QCI (Quality Council of India). ICMED Certification process allowed us to build competencies and confidence needed to strive for MDSAP and winning the Indian Design Award from DIPP helped us in winning the prestigious Japanese Good Design (G-Mark) Award,” explained Mr Rajiv Nath, Joint Managing Director, HMD. As per company, the Safety IV Cannula – Cathy SiPClip is the most revolutionary technology and patented design greatly minimizes the chances of accidental needle stick injury among health workers and nursing staff when they attach IV Catheter and remove the blood infected needle from a patient which results in numerous unfortunate infections and even deaths, particularly in developing countries like India. The auto protection technology of Safety IV Cannula Cathy SipClip is designed to provide Involuntary Activated Safety due to presence of a protection device SipClip which encapsulates the tip of the used needle, when introducer needle is extracted from the Catheter. “HMD will continue pursuing excellence in user friendly intuitive innovative design and contribute towards our ongoing commitment of aiding access to affordable and safe healthcare for common people in India and other developing Countries” Added Mr Rajiv Nath.